Mangaluru, Mar 21,2017: In an interaction with media, South Zone Motor Transport Welfare Association has called for an indefinite strike from March 30, 2017 urging the union government to fulfill their demands. According the strike called, private buses, lorries, taxis and maxi cabs are expected to stop plying on the roads in Karnataka, Tamil Nadu, Kerala, Andra Pradesh, Telangana and Pondicherry from 06.00 AM of March 30, said South Zone Motor Transport Welfare Association Leader, Karnataka State Lorry Owners Association President GR Shanmugappa said. Rise in transport fee, scraping the 15 or more year old vehicles, exempting the vehicles from speed controlling equipment, common registration process and tax on the tourist vehicles in South India and others are the major demands of the association, he said briefing the media. 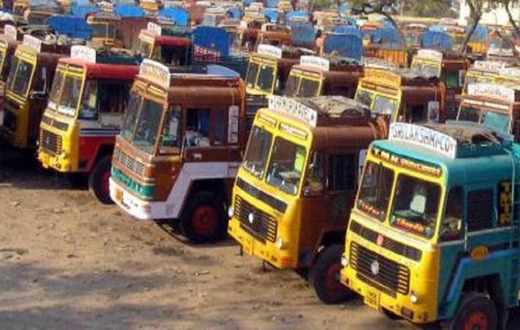 Meanwhile, various association leaders including, Karnataka Bus Owners’ Association, Udupi District Lorry Owners Association, Dakshina Kannada District Lorry Owners Association and others stated that they would support the scheduled strike from March 30. STRIKE IS NECESSARY FOR LORRY OWNERS AS THEIR DEMAND ARE GENUINE AND PENDING SINCE LONG.BUT GOVT SHOULD INTERVENE IMMEDIATELY.